These are my webrings. Why don't you join a few? This Official Site Fights Webring site is owned by Heather. Want to join the Official Site Fights Webring? is owned by Heather's Homepage. Want to join the Wee Ones Fairy Circle? Want to join the Wee Fairy I Believe? Want to join the The GOTW Member's Ring? This NetGirls webring is owned by Heather. Click here to get more info on the NetGirls Webring! site is owned by Heather. Click here for info on how to join The Anything Ring. All G-Rated web-sites. Fun for the whole family! If you wish to add your website to this ring, click here to: JOIN THE TOUR! This Mystery Tour Web Ring site owned by Heather. 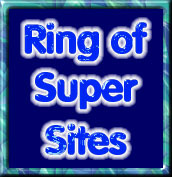 Want to join the Ring of Super Sites?